Mobile devices offer more features every day, and the applications are more complex and require more processing speed. For this reason, the terminals are quickly outdated and we often have troubles to go through the day with the battery we have. One option that is becoming more widespread consists on changing the processor speed, method known as overclocking or underclocking. 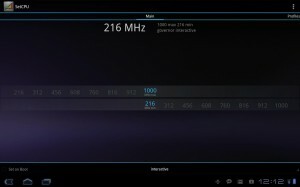 Overclocking means to increase the speed of the processor, which allows us to improve its performance. Underclocking, however, involves reducing the processing speed, reducing thus the battery consumption. The modification of these settings imply certain risks, since increasing the processing speed also increases the temperature of the processor, and if we are not careful, it could get burned. On the other hand, if we reduce its speed too much, it may stop working. To avoid these problems and to configure it safely, it is advisable to download the application SetCPU. This application, which can download from the Play Store for $1.99, allow us to modify the processing speed without any risk for our device. When we run the application, we can modify the maximum and minimum values in which the processor will work. SetCPU offers the possibility to create different profiles, so we can have different working configurations to suit our needs. For example, we can define a maximum temperature for your CPU, which imply that the speed will drop if this value is reached. 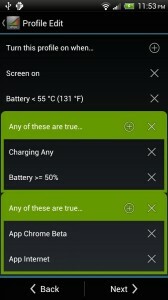 Or we can also define a battery level at which the processor speed decreases to extend the charge left in the device. In order to install SetCPU and change the speed of the processor, we must have a rooted phone. Rooting an Android device is very simple and will allow us to access to normally inaccessible parts of the system.